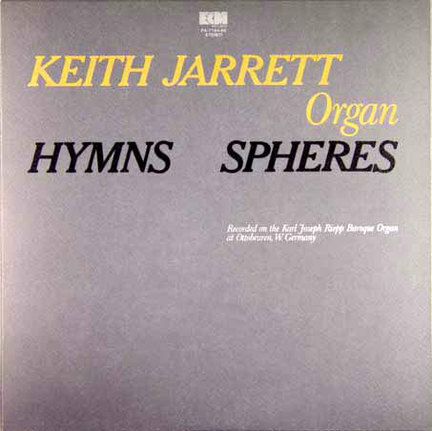 Keith Jarrett was only a year removed from The Köln Concert-which became the best-selling album in jazz history to that time-when in 1976 he released Hymns/Spheres, a two-LP solo album recorded on the Karl Joseph Riepp “Trinity” Baroque pipe organ at the Benedictine Abbey in Ottobeuren, Germany. This new two-CD reissue marks the first time that ECM has released the recording in its entirety on compact disc. Delivering an album to ECM that, aside from the overarching concept of melody-filled free improvisation, bore virtually no resemblance to its bestselling predecessor was precisely the kind of maverick decision that Jarrett would become known for throughout his career. Fortunately for him, the label didn’t blink, and even if Hymns/Spheres is seen as an anomaly in Jarrett’s discography today, it’s a singularly stunning one. Jarrett’s facility on the instrument is mighty, and his classical sensibility is unimpeachable. The program consists of the nine-movement Spheres bookended by “Hymn of Remembrance” and “Hymn of Release,” all of it unfolding slowly and orchestrally: Jarrett obviously enjoys the instrument’s capability to fill the cavernous basilica, and milks all available sonic features. The end result is stately music that serves to add to our admiration of him as an indefatigably intrepid artist.